The very ethos and business philosophy of Hayleys Agriculture Holdings is to serve the farming community through agri inputs and value added services that are made available through its island wide network. The company’s prime focus is to empower the farmer by bringing together best global practices most suited to Sri Lanka, stewardship of national resources and finally ensuring long-term profitability for the farmer by making him/ her more productive and professional. The company strongly engages in the entire agri supply chain by linking rural farmers to global markets. Hayleys Agriculture is the largest fruits and vegetable exporter in Sri Lanka accounting for 34% of the country’s exports where products are supplied to world famous brands and companies such as McDonalds, Burger King, and Heinz. Even during the 30-year civil war that ravaged Sri Lanka, Hayleys Agriculture Holdings did not abandon the farmers in the areas which were most affected. In fact the company always had the farmer communities in its heart irrespective of the geographical location, security and safety and hazards relating to a ‘conflict zone’ environment. Special attention was given to marginalised and vulnerable communities and through the appropriate transfer of technology and agricultural expertise and by extending the benefit of available networks and marketing opportunities, the company provided many prospects farmers throughout Sri Lanka to be a part of an out grower network to supply their produce to international markets. As new opportunities emerged in producing and exporting ‘seaweed’ to international markets, the company gave this opening to the poorest of the poor; the internally-displaced persons in the Northern Districts of Sri Lanka – the victims of a 30-year war on terrorism. It is this endeavour that has been recognised by ‘The Asia Responsible Entrepreneurship Awards Program,’ the most prestigious awards for CSR in the region, as the winner of the ‘Social Empowerment Category’. Hayleys Agriculture recognised the fact that Aqua-Agriculture has the potential of becoming a new form of employment for the coastal communities; vertical like agriculture, animal husbandry and fishing. The new business development team at Hayleys Agriculture examined and pursued aquaculture and appreciated the fact that one of the key methodologies of addressing over exploitation of coastal fisheries stocks, an issue that the country is facing currently, is through the creation of alternative livelihood opportunities for fishermen. Marine aquaculture is a one such alternative that is increasingly popular following a number of successful introductions in the region. One example is the development of seaweed farming. At a juncture where fishing has become uneconomic with unpredictable income, seaweed farming is providing an assured income, which will no doubt revolutionise (can be called ‘blue-green revolution’) the rural economy of recently resettled coastal districts of northern Sri Lanka. Sri Lankan Government is giving immense assistance and support to the feasibility studies carried out and pilot scale commercial cultivation of Kappaphycus in Gulf of Mannar to uplift the economy of most vulnerable coastal people. Hayleys Agriculture Holdings Ltd. embarked on a Seaweed (Kappaphycus alvarezii) Cultivation Project in 2014 to establish a seed bank to support ‘Divineguma’ household development program under the Ministry of Economic Development. This seaweed project is currently been carried out in the areas of Valaippadu, Kiranchi, Iranai Matha Nagar and Pallikuda with technical support from NARA and NAQDA. The Asia Responsible Entrepreneurship Awards Program has hailed this project as an exemplary initiative and as a testament to the continuous commitment to protecting the environment, uplifting the society and community as well as being a responsible entrepreneur. Enterprise Asia’s Asia Responsible Entrepreneurship Awards program (AREA) recognises and honours Asian businesses for championing sustainable and responsible entrepreneurship in the following categories: Green Leadership, Investment in People, Health Promotion, Social Empowerment, SME CSR and Responsible Business Leadership. Hayleys Agriculture Holdings is proud to win this prestigious international award and salutes the tireless commitment of the entire staff and very specially the project team for their persistence. 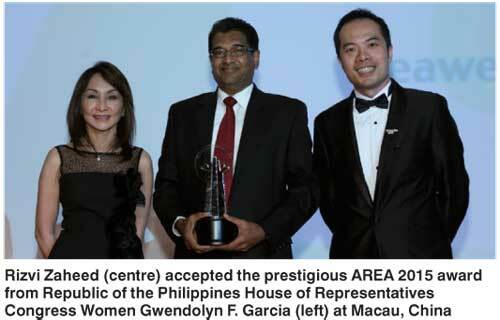 Rizvi Zaheed, Managing Director of Hayleys Agriculture Holdings and Group Director of Hayleys PLC accepted the award at the prestigious International CSR Summit 2015 which was held at Banyan Ballroom, Banyan Tree, Macau, on 19 June. 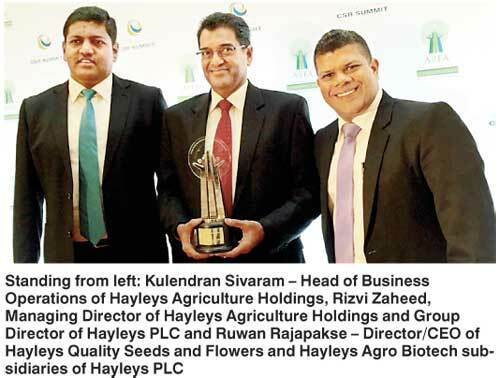 Ruwan Rajapakse, Director/CEO of Hayleys Quality Seeds and Flowers and Hayleys Agro Biotech subsidiaries of Hayleys PLC and Kulendran Sivaram – Head of Business Operations of Hayleys Agriculture Holdings also attended the awards ceremony.